Did you know that Uranus and Neptune are blue - in part - because of cow fart (methane) gas? No, neither did I until I discovered it with my class of 5 and 6 year olds a couple of weeks ago. It's amazing what you can learn with kids leading the adventure! The other thing I didn't know about space until just a few weeks before that particular life changing discovery is that space (in the blue fart gas giants sense) doesn't feature in the ACARA content descriptors until Year 3 and then again in Year 5. And so what does an intrepid space explorer do? My unit plan grew around these goals. The topic could have been gyprock or giraffe mating habits but... Well... I don't know much about the first and, to be honest, even less about the second, so space seemed like a pretty safe option. I collected a whole pile of books (yes, the old school style ones with pages that can - and do - rip), some charts, some posters, a load of youtube clips, some models, some blow up globes, a lot of space stickers, a lovely quilted wall hanging featuring photos of space, my very special hand painted space shoes (they're amazing - go check out the artist's blog entry about them ) and set them out in front of the class and asked what they already knew about space. "Space holds up the moon!" "There are asteroids in space, but mainly in earth." "The sun has grey spots on it where it goes out until someone lights it again." "There are planets on earth and the sun is in space." "The sun goes down into the ocean at night." You get the idea. Following this we worked with some Grade 5 and 6 students to explore the books and charts before deciding, as a class, that we wanted to explore the space around earth - which I expanded to mean the solar system. We decided on some questions we wanted to answer about each planet and 10, 9, 8, 7, 6, 5, 4, 3, 2, 1! Blast off! We became space explorers. As you can imagine it's a little hard to use your senses to explore space in a particular meaningful way and so I had to get a little creative. We held 'moon' rocks, and tried to land on a gas giant by jumping into the air in the playground. We compared the number of moons of each planet. 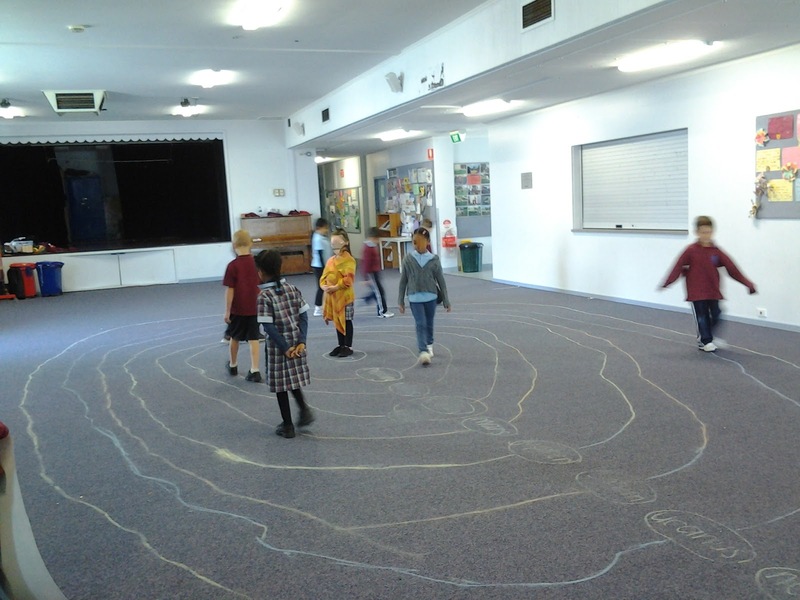 We all span around the sun to understand day and night and drew great big orbit rings on the carpet to follow to understand why the further away from the sun the longer the orbit takes. We learnt that some planets' days are longer than than their years - and how that related to our spinning and orbiting. We created a journal of our explorations. Each day we visited a new planet - we knew the way because we learnt a 'cool' rap early in our exploration - and created a page for our journals. Each child chose what to include in their own journal and I helped with vocabulary and spelling. (The literacy component of the whole thing was quite astounding - I was stunned at the writing achievements.) 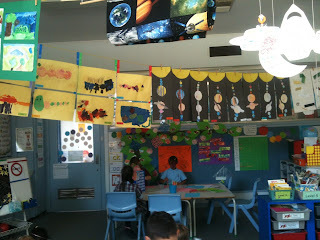 We ordered planets and we made a space display of our favourite facts. We sang, we danced and generally lived it up as space explorers. Did we meet the goals though? Did we explore and observe with our senses? Definitely (even our sense of smell was involved once we learnt about Uranus and Neptune)! Did we respond to questions about familiar objects and events? Not only did we respond but we posed questions. Did we plan and conduct inquiry? Yes, with all of our senses. Did we discuss our observations and represent ideas? All day! (I think I owe some parents an apology for their children's latest obsession!) Did we share ideas? Um... yes. Yes we did. At the end of the day the children proudly took home a completed Space Exploration Journal and a whole range of science experiences. I probably learnt almost as much about space as they did but more importantly I learnt valuable lessons about teaching Science as a Human Endeavour and Science Inquiry Skills and about myself as a teacher. Onwards and upwards... Shoot for the stars and all that jazz. Did I mention how much fun we had? ooooh, can I come and join in YOUR classroom?